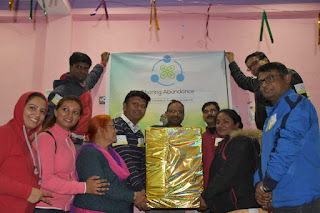 Lucknow, January 05, 2019: Independent representatives of Direct Selling company QNET have once again come together, this time to brighten up the New Year for the underprivileged. In a series of events spread across 22 cities throughout India, various groups of Independent Representatives have come forward to raise funds and help underprivileged communities. Over hundreds of entrepreneurs, who are professionals across all age group, run a successful direct selling business with QNET, have pledged up to INR 1 lakh per city towards important causes benefiting a local community in need. While various Independent Representatives have been coming together during Diwali every year, this is the second year that some of them have initiated such activities during the New Year to reinforce their commitment to helping communities and their own belief in the spirit of giving. As part of this effort the group of entrepreneurs in Uttar Pradesh covered two cities including Lucknow and Varanasi contributing to support activities by providing essential commodities including clothes, blankets and stationaries. The activities were carried across various organisations including Ek Pahal Sewa Sansthan in Lucknow and Manushatva Vikas Shoud Samstaan in Varanasi.